St. Augustine is a city on the Atlantic coast in Northeastern Florida. 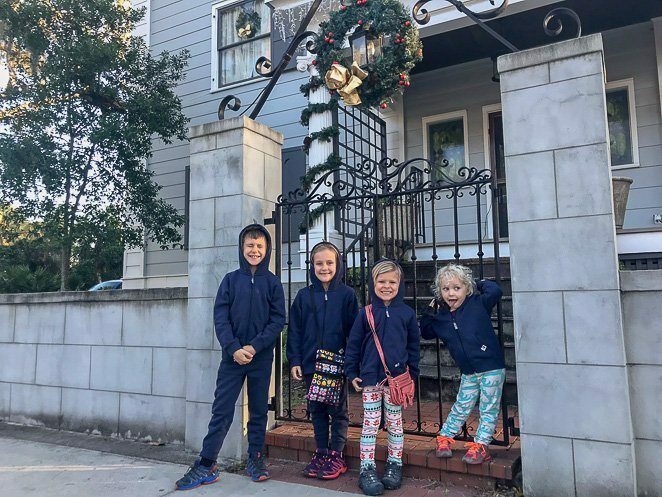 We spent over 4 weeks in St. Augustine, FL in December, giving our family of 6 a chance to experience a bit of what it had to offer. What we found surpassed our wildest expectations! 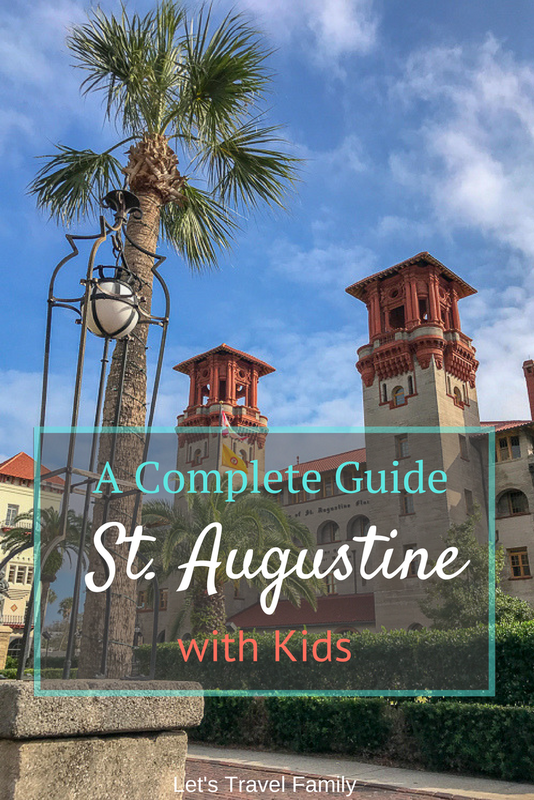 If you are wondering what to do in St. Augustine with kids, then look no further. 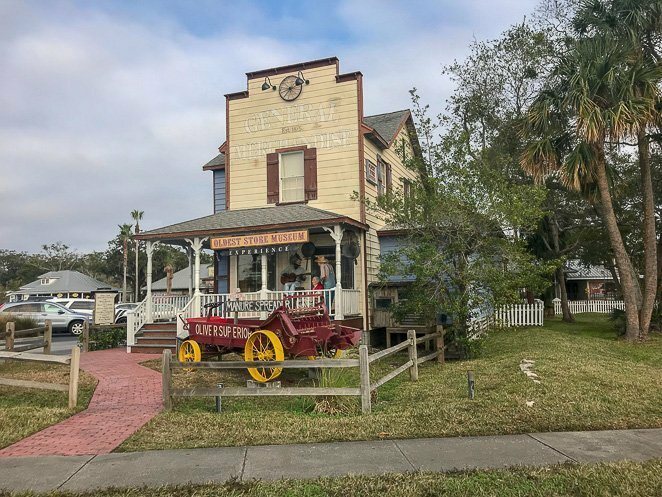 The city has so much history that children who do not seem to be interested in learning about our country's history, will not be able to leave without picking up fun history facts of St. Augustine. St. Augustine is recognized as 'The Nation's Oldest City'. It was founded by the Spanish in 1565 becoming the first European settled city in the USA. 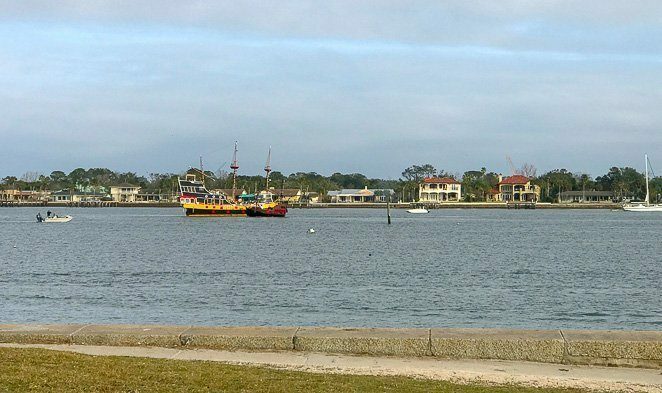 St. Augustine has fought off pirates, housed past Presidents, and withstood hurricanes giving visitors a chance to see some spectacular architecture. 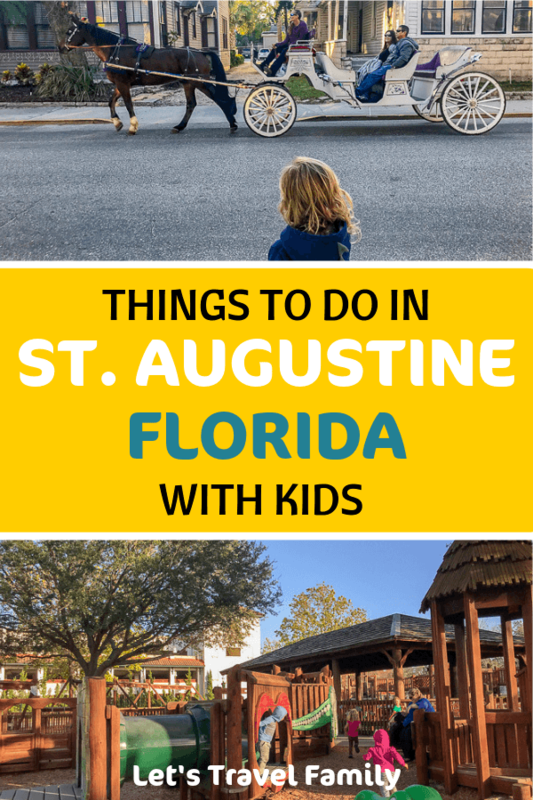 If you are looking to take your family to the Nation's Oldest City, or make the best itinerary for a St. Augustine vacation or road trip, then here are some of the best things to do in St. Augustine with kids. The reenactment of cannon fire is enough to get your kids excited to visit this National Monument. It did for our kids! Be sure to check out the National Park's website to find out the cannon fire schedule as it does change. The Castillo is the oldest masonry in North America. It was built out of a rare form of limestone called coquina in the late 1600's by the Spanish. There is so much to see and learn at the fort, that I highly recommend taking a few hours in your day to spend visiting the Castillo. Your kids can also partake in the Junior Ranger program and earn a badge while visiting the Castillo. 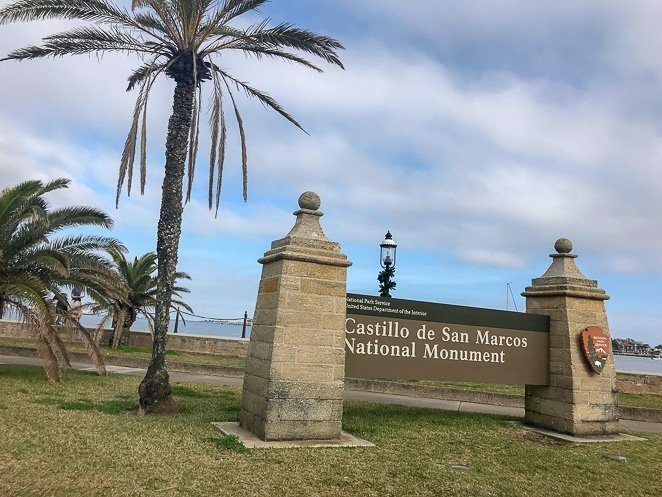 The Castillo de San Marcos is a National Monument run by the National Park service. It is open from 8:45am-5:15pm daily. If you have an annual National Parks pass then you can use that for a free entrance. Or, you may purchase adult walk-in tickets for $10 per person 16 years old and children ages 15 or younger may enter free with a paid adult. Parking is run by the city of St . Augustine and can be limited. It cost is $2.50 per hour. The city's parking garage is only 3 blocks away and has an all-day rate. You will make your kid's day if you get tickets for the Red Train to ride the trolley through the city. It's an open-air sight-seeing trolley that takes about 80-90 minutes in it's entirety. You can get on and off as many times as you'd like throughout the day at their 20 different stops. We sat on the Red Train for an entire tour as a way to allow our little one to take a nap, while our older kids listened intently to the conductor explain the history of the city as we drove by each area. 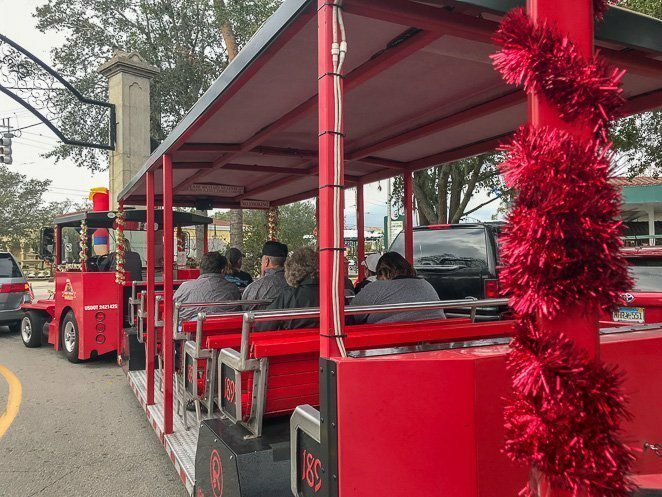 The Red Train Trolley is owned by Ripley's Believe it or Not and discounts can be found by purchasing combination tickets. The train runs from 9-5pm, depending on the season. Prices for 1 day adult: $20.99 and child ages 5 and up: $8.99. Children 4 and under are free! Prices for a 3 day ticket for an adult: $23.99 and child: $9.99. Further discounts can be found by purchasing a combination ticket with Ripley's Odditorium, Bayfront Minigolf, and the Red Train Tour. The Odditorium can be a fun place to visit to see some strange things. That explains the name 'Odd'-itorium. Experience 3 stories of strange things from around the world while visiting. The Red Train makes a stop here as well! The price for adult tickets are $12.99, children 5 and older are $6.99. Children 4 and under are free! Further discounts can be found by purchasing a combination ticket with Ripley's Odditorium, Bayfront Minigolf, and the Red Train Tour. 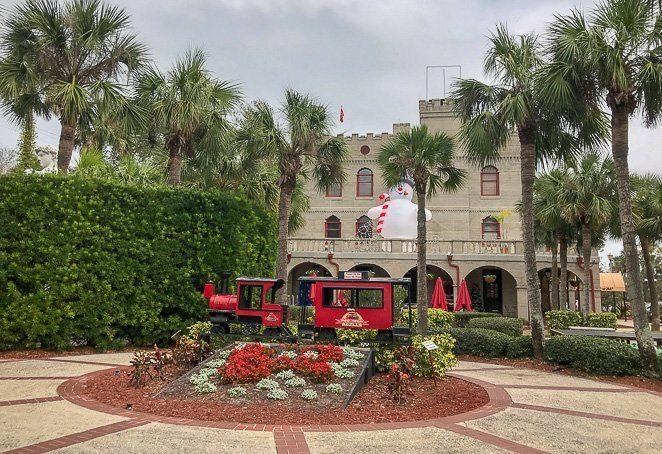 The city's oldest minigolf course is located right in the heart of downtown St. Augustine. It offers a snackbar and a beautiful view! The Red Train has a stop right in front of Bayfront, which I'd highly recommend taking as there is not much parking nearby. Tickets are $5.99 per adult and $3.99 per child. Further discounts can be found by purchasing a combination ticket with Ripley's Odditorium, Bayfront Minigolf, and the Red Train Tour. Find a parking spot and put on your walking shoes. St. George Street is a walking only street that is a must-see in St. Augustine. The cobblestone street, historical storefronts, and overall energy in the air makes you feel that you have been brought back in time. Don't worry though, as there are many shops, restaurants, ice cream parlors, candy stores, and museums along the street. It is well worth trying to walk part or all of it with the kids! We enjoyed our time at the candy store and spontaneously window shopping at shops that looked interesting to the family. I suggest bringing a bag with bottled water and be ready to grab a great bite to eat along the street, as the smells are very enticing. Parking can be a bit tricky depending on the time of day you visit. You may be in luck to find a side street with parking available, otherwise I recommend using the city parking garage next to the visitor center. 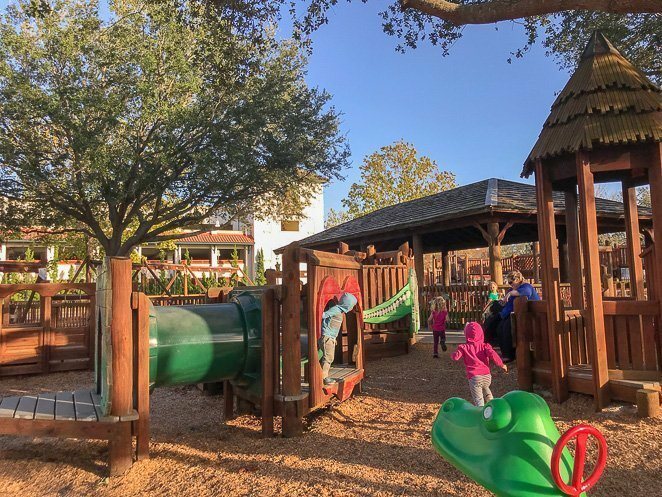 Project SWING is one of the best finds in St. Augustine for kids. We spent hours at the playground, as there was something for all ages. Swings, slides, climbing structures, a tire swing, and even a shaded pavilion with picnic tables for a quick bite to eat. The nearest bathrooms are on the other side of the city's parking garage at the visitor center. If you want an up close and personal viewing of all the species of crocodilian, then this is the place to visit. Take a zip line tour over the Crocodiles! Age, height and weight restrictions apply. You must be at least 8 years old, over 52 inches tall, and less than 250 pounds. You also must wear lace up boots or shoes. For a visit the prices are: $25.99 per adults, $14.99 for children ages 3-11, under 2 are free! If you'd like to participate in the ropes course and zipline, check the website for current prices and discounts on entrance fee tickets. 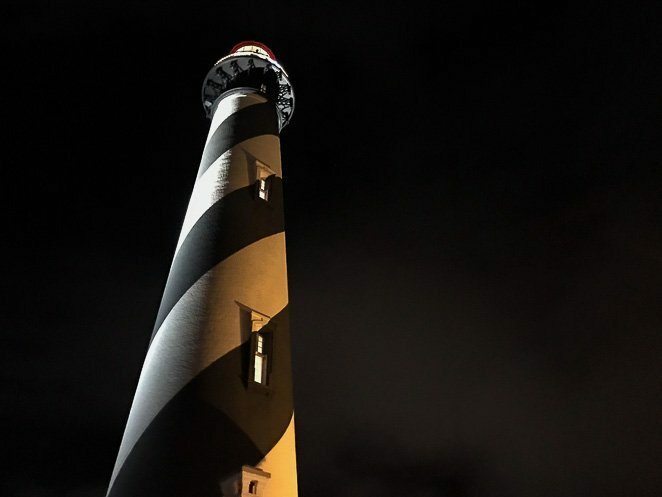 The Saint Augustine Lighthouse can be a great place to take the family. However, be aware that people need to be 44 inches or taller to climb the stairs to the top of the lighthouse. This is due to height of the railing going up and safety concerns. Our children were not able to go up, but we did take some time to visit the museum and gift shop. The restored Keeper's House was a great opportunity to show the children first hand how people lived years ago. The hours are 9am to 6pm and tickets to visit are $12.95 per adult and $10.95 per child 12 or under or under 44 inches tall. This gives you access to the Lighthouse, the restored Keeper's House, nature trails and gift shop. 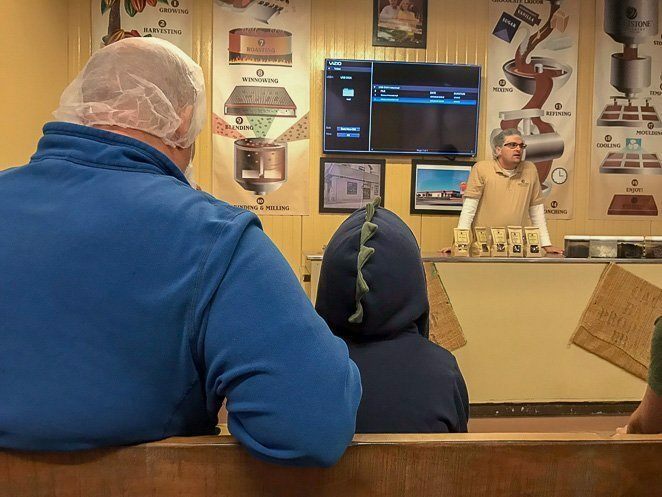 Delicious chocolate, interesting factory tour, very affordable, family-friendly and educational are just some of the ways that I'd describe our experience at the Whetstone Chocolate factory. It was one of the highlights of our trip to St. Augustine. The Whetstone Chocolate tour provides a brief history of the origin of chocolate and the beginning stories of Whetstone itself. The adults and children stayed interested in the video, visuals, tasting and factory walk-through tour. So it was really great for all ages. We also all enjoyed the many tastings provided! Our 2-year old daughter even stayed quiet and attentive throughout the 45 minute tour. $8 per adult and $5.50 per child ages 5-17 years. Children 4 and under are free! Free tastings are included in the price of the tour. Tours are approximately 45 minutes long. A great way to get onto the water with your kids is to jump on an interactive pirate cruise. Black Raven Adventures has 1 to 2 cruises each day so be sure to check out their website and reserve a spot ahead of time. You may be able to witness Captain Hook in a sword fight! $34.95 per adult, $24.95 per child. Be sure to make reservations ahead of time. If you are at all interested in learning more about the history of Piracy, then this is the place to visit. The museum is very welcoming to adults and children alike. 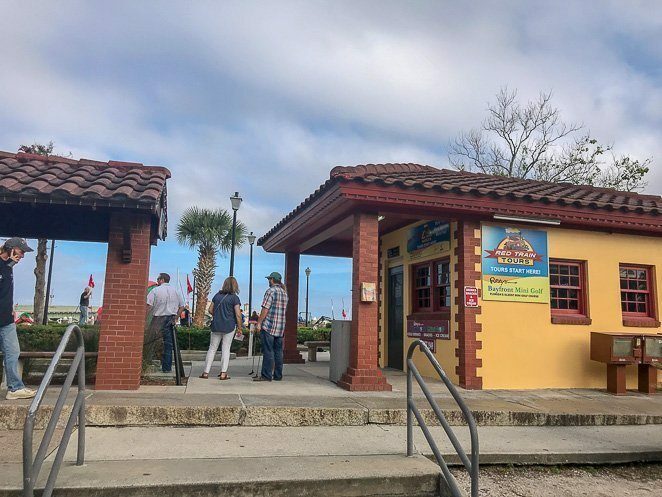 With cross bones and skulls, to fantastic pirate artifacts, the Pirate and Treasure Museum in St. Augustine has something to interest everyone in your family. $13.99 per adult, $6.99 per child ages 5-12. Children 4 and under are free! 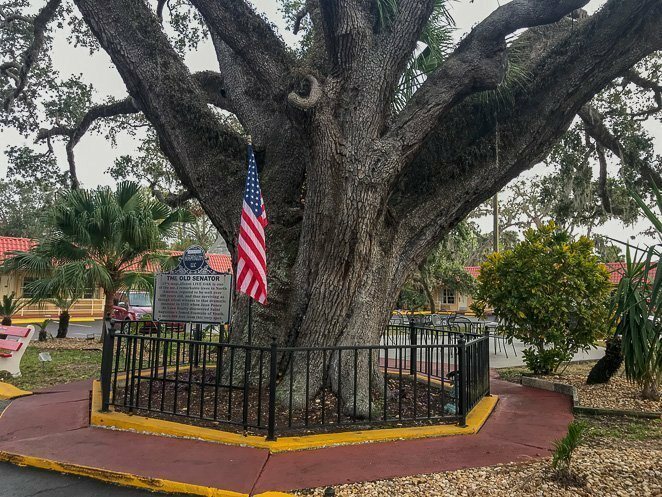 Visit the oldest resident of St. Augustine, the Old Senator! This live oak tree is over 600 years old. That means that this tree was here when the Spanish came to settle in St. Augustine. Old Senator is in the parking lot of the Howard Johnson hotel near the Old Jail. The Old Jail is a fun place to take the kids. The in-costume 'inmates' will give your family a tour of the jail to really help engage the children into the history of St. Augustine. $8 per adult, $5 per child 6-12 years, under 6 is free! The actors in-costume make this another great interactive learning experience for the entire family. Be ready to go back in time and see what you might purchase in the early 1900s. $5-10 per adult and child. Check the website for updated prices as discounts are available often if you purchase online. Under 6 is free! 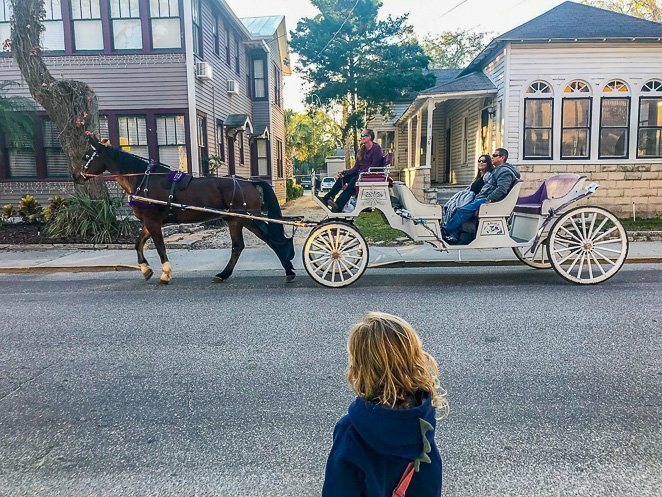 If you are a looking for a unique way to tour the beautiful St. Augustine, then take the family on a horse drawn carriage ride. The family will really get a kick out of riding behind a horse while you see the sights! $85 for 1-4 people, $20 for each additional person. 10 years or under are free! Tour length is 45 minutes. Cash only. Pay at the end of the ride. 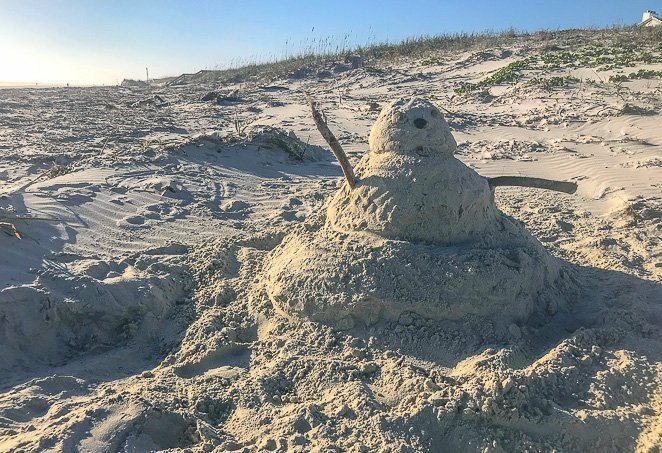 If you are looking for a nature beach experience, the chance to see wildlife, and hiking trails among the sand dunes, then Anastasia State Park is the place to visit. It is located just outside of the Historic St. Augustine. You may also rent kayaks, paddle boards, canoes, and boats at the State Park. 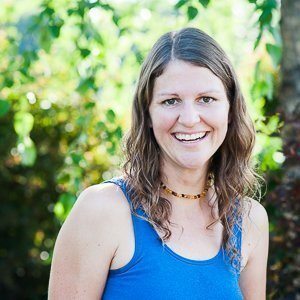 $8 per vehicle holding 2-8 people, $4 per single passenger vehicle, $2 per pedestrian or bicyclist, $28 per night to camp. Click here for more details. On a rainy day, you often are scrambling to find something to do with the kids. Well, look no further. 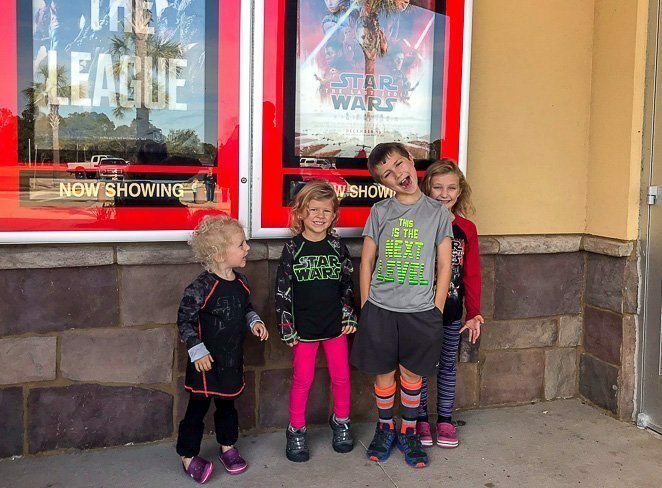 Epic Theatres in St. Augustine was a great place to take the kids to see the new Starwars movie. They had great customer service, affordable tickets and comfortable seating. The beaches in St. Augustine are some of the most pristine I have ever seen. It was actually rated in the top 10 beaches of the world! The sand is perfect for making sand castles, as it's sticky and wet and ready to hold. 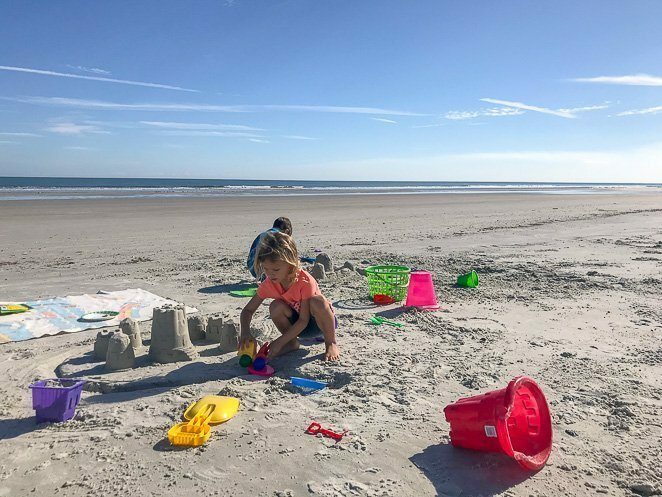 Our family loves visiting great beaches and my kiddos made more sand castles than I could count during our 4 weeks in St. Augustine. It was our first time riding bikes on a beach. I didn't even know that you could or should. It was so fun to see the kids ride around and know that when they would fall, they were much less likely to get hurt. 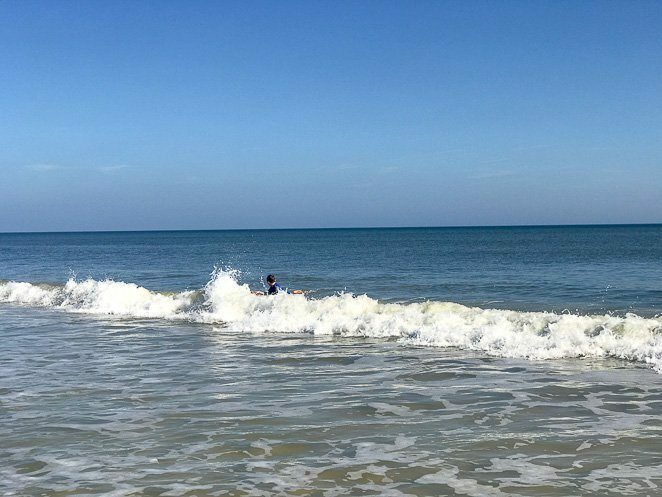 What better way to enjoy the calm Crescent Beach waves then to learn how to boogie board? My 8 year old son really enjoyed getting into the water and trying it out. 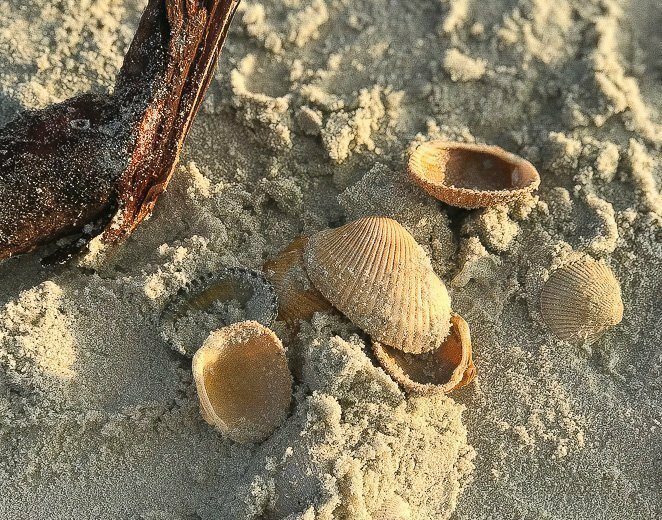 There is an abundance of seashells on the beaches of St. Augustine. They are just ready for the taking. Be sure that you do not collect live shells though, as that is illegal. Our kiddos enjoyed drawing my name in the sand with their feet! It was a fun late afternoon activity when they were all sand castled-out. We decided to spend the winter in Florida, exciting to go an entire winter without snow!! Yet, the kids loved building snowmen back in Minnesota. So we really got a kick out of seeing this cute Sandman on the beach! Back 40 A1A is a restaurant that we wanted to go back to. 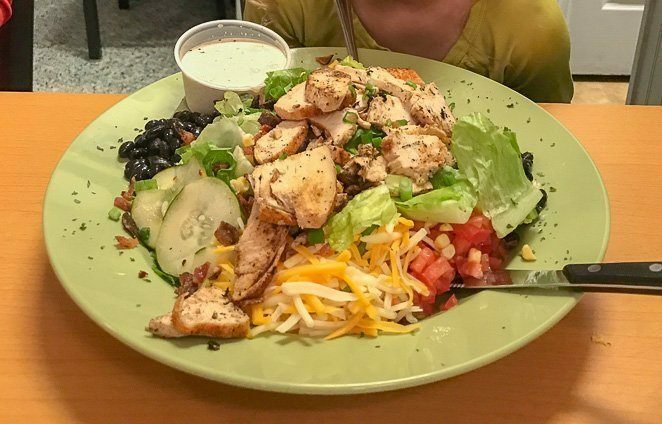 They had excellent service, the prices were great, and the food was out of this world amazing! Homemade salsa and chips were a huge hit with the kids. While Tony and I really enjoyed their variety of authentic tacos and large Farmhouse Chicken salad pictured above. Al's has amazing pizza and excellent service. They were very friendly with our children and had great recommendations for authentic Sicilian pizza. The server even made sure to make a dairy free pizza for our littlest gal that cannot have dairy, by using marinara sauce that was dairy free and no cheese. If you are looking for a great place to walk to and grab excellent Italian, then look no further. Thai House and Sushi Bar had great customer service and excellent food. They even sat our family of 6 inside their small restaurant when we requested to be inside, due to not wearing jackets on a cool evening. They did have a large outdoor seating area with many heaters spread out. 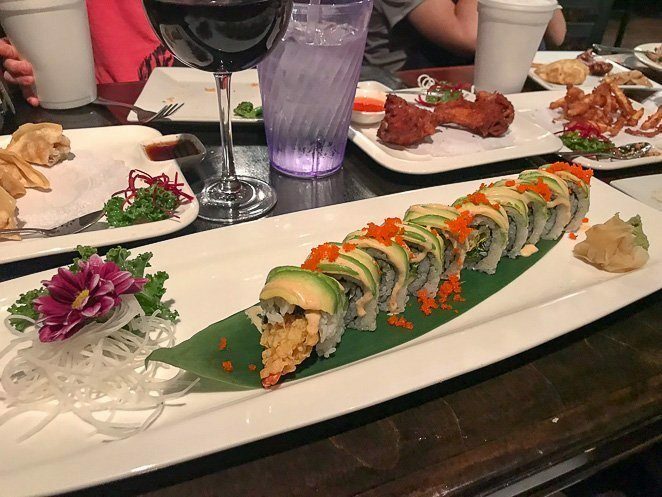 I especially loved the sushi. Grab a cup of coffee, hot chocolate, gelato or snack! It's a great place to appease the littles and the bigs and it's in the heart of historic St. Augustine. Whether you are looking for a family destination vacation, or a weekend trip with the kids, The Nation's Oldest City in America is a fantastic place to take your kids. 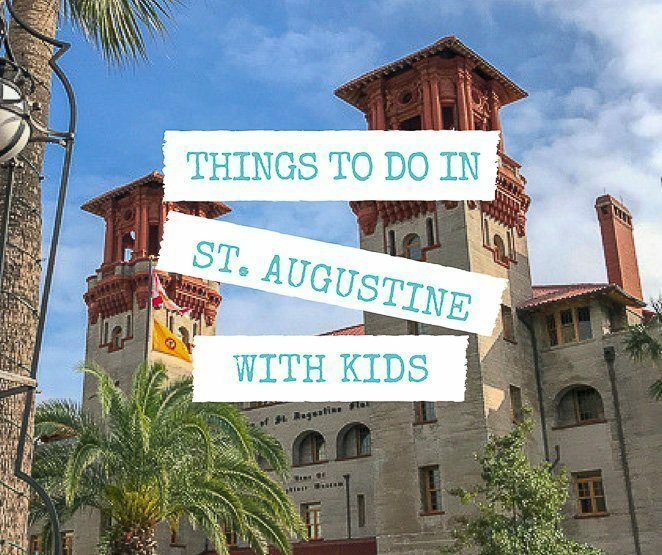 There is an abundance of St. Augustine attractions, giving your family the opportunity to pick and chose the things that most interest you all. Our family really loved the time we spent in St. Augustine. 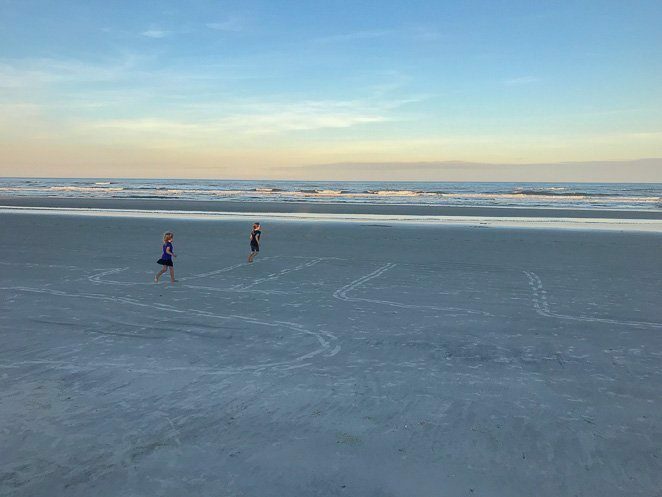 We spent 4 weeks in the area and feel like we could go back again next year and get even more out of our family vacation in St. Augustine. Florida is a great place to take your family, especially during the winter months. 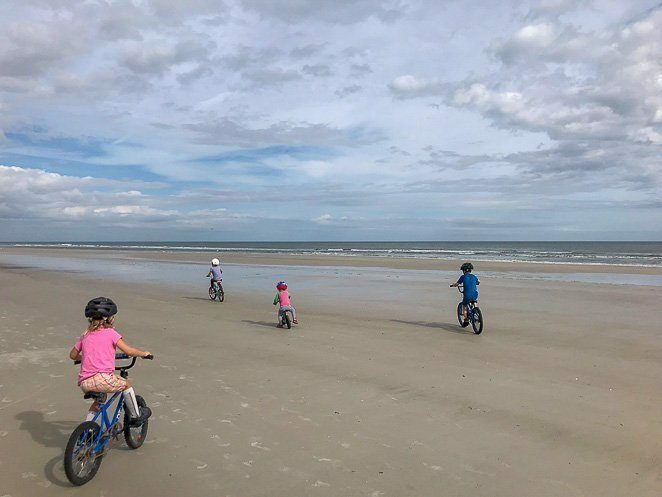 Naples Florida, Legoland Florida and St. Augustine are just a few of the great places to plan vacations to with kids. In St. Augustine the people were nice, the beaches were beautiful, the weather was great, and the food was excellent.